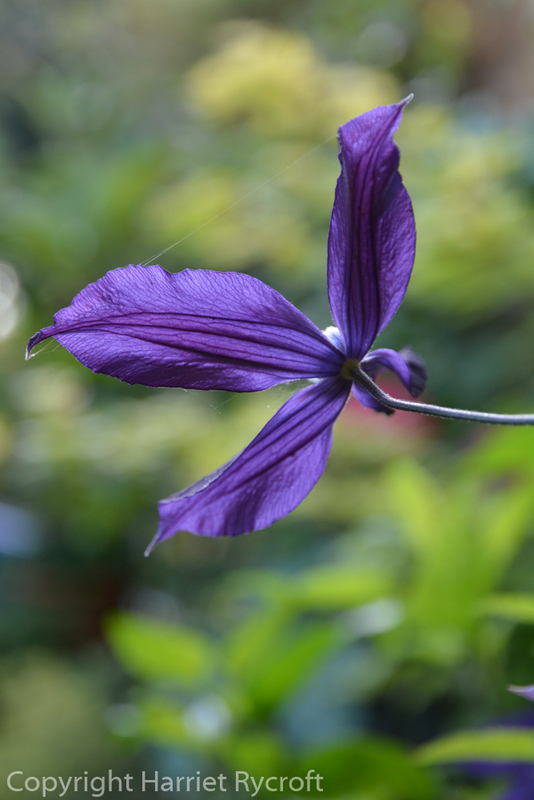 A friend on Twitter mentioned this clematis recently and remarked on how long it had been flowering in his garden. It was only then that I realised that mine has been flowering lustily for about a month and I have been rather taking it for granted. 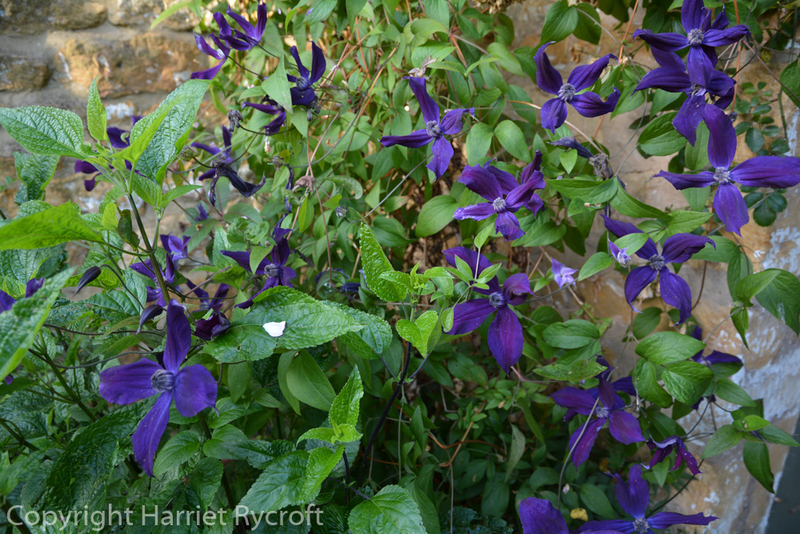 Clematis ‘Polish Spirit’ lives in an outsize pot tucked in the corner outside our kitchen door. It only gets sunshine first thing in the morning but doesn’t seem to care. 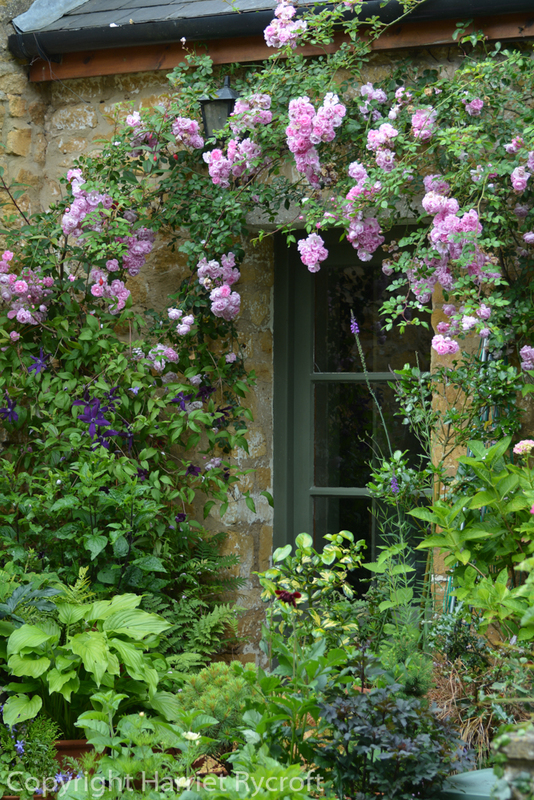 It flirts at the same time with Rosa ‘Débutante’ (see previous post) and with Fuchsia ‘Lady Boothby’, eventually abandoning the former for the latter as she comes into her late summer prime. Salvia ‘Indigo Spires’ (as far as I remember) is also in there – and as the Salvia and Fuchsia are not quite hardy here the pot gets wrapped in fleece & bubble wrap for the coldest part of the winter. 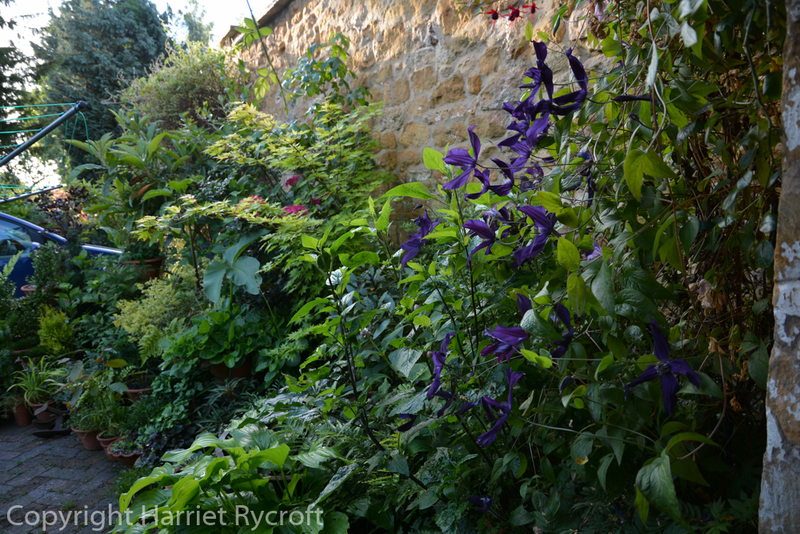 I have to remember to take the coverings off and have a spring clean as early as possible because that corner is Snail City and resourceful gastropods like to climb up the wall, get into the pot and marmalise the new clematis shoots while sheltering under the cosy covers. I give it a tidying prune at this time too but don’t take a great deal off because I know that more growth will be lost… The whole pot then gets a sprinkle of slow-release fertiliser and a top-dressing of fresh compost too. There is apparently some disagreement as to whether this is a C. viticella or a jackmanii. Frankly, my dears, I don’t give a damn. I bought it about three years ago because I had wanted it ever since seeing it at Barnsdale Gardens in 2011. 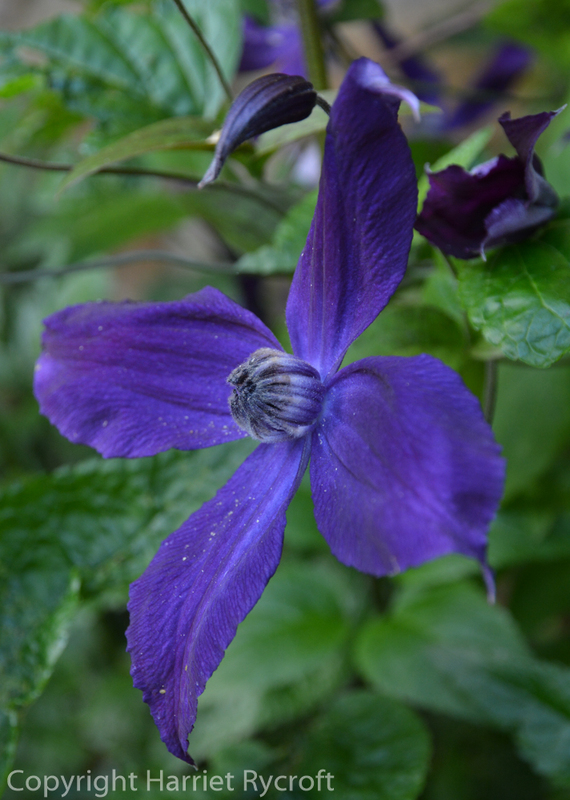 Clematis ‘Polish Spirit’ was raised in Poland by Brother Stefan Franczak in the 1980s and introduced to the UK by the doyen of Clematis, Raymond Evison. It has an RHS AGM. During the spring I have to guide the new clematis shoots onto the hazel sticks in the pot and away from the wall, otherwise more oral pruning takes place. Of course I don’t remember to do this consistently and so I suspect that the clematis really ought to be much bigger by now. But never mind. 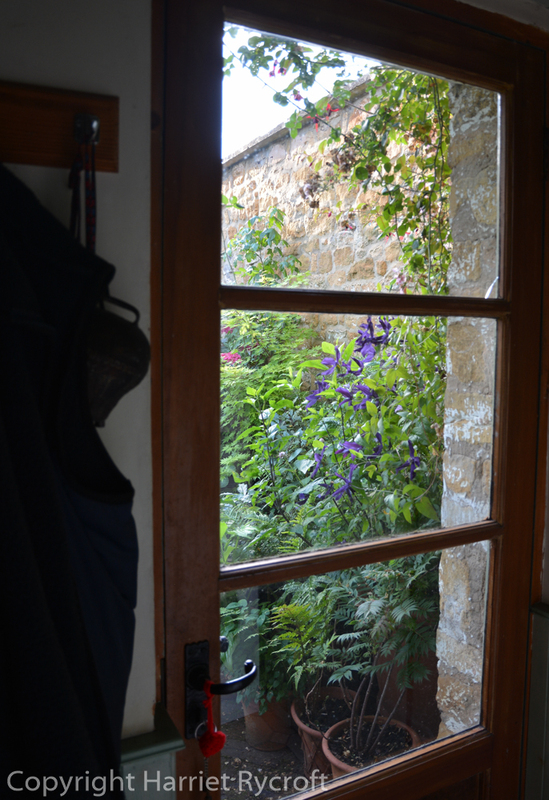 In the morning I like to be able to look through the glass of the kitchen door at the back of ‘Polish Spirit’ – you don’t often get to see clematis flowers from behind and backlit. I love that rich, purplish blue. I can also talk to it while I’m hanging out the washing. Yes of COURSE I talk to my plants – don’t you? From the kitchen door. ‘Polish Spirit’ watching over the car and the washing line. Thanks Jo, yes it’s a great plant, although I’d be exaggerating if I said I had a curtain of it to look through. Not much survives in that corner, but it seems to manage ok. Raymond Evison is a font of knowledge and a true gent, I first met him at Bingerden in The Netherlands and we eventually managed to get him to come and speak at Whichford just before I left, absolutely fascinating to listen to and a really nice man.